Chemagility is a business intelligence, analysis and consultancy services provider specialising in the global chemical distribution industry. We combine consulting and research capabilities, market intelligence and industry understanding with a focus on providing insight and solutions related to our expert knowledge of the world's chemical distribution industry. 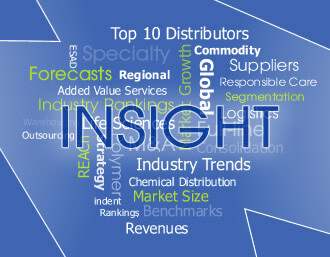 Chemagility continuously monitors chemical distributor companies, industry trends, M&A activity and produce a wide range of bespoke publications and client specific reports which provide indepth market analysis of the industry. Our custom research services are backed by our Global chemical distribution databases including The World Chemical Distributor Directory - which provides comprehensive data on the activities of nearly 7,000 chemical distributors in Europe, America, Asia, the Middle East and Africa. Whether you want to ﬁnd out more about the latest developments in chemical distribution markets or intend to expand your client base, our consultancy services, reports and databases provide cost effective and immediate solutions. Our clients include chemical companies, international consultancy groups and investment companies. Chemagility was formed in 2005 by founding partners and directors, David Brown and Neil Mitchell who between them have over 50 years of experience in the chemical distribution industry. The company launched the World Chemical Distributor Directory in 2006 which is now the leading resource on the Web for information on chemical distributors. Please contact us on +44 (0)1420 476191 (sales) or +44 (0)1420 520393 (general). Lines open: GMT 8.30am - 6.00pm Monday to Friday.